More hilarious Konglish adventures in K-Town. I believe they refer to the above special as "Black Happy Hour," in reference to "Black Day" which in Korea is the day (April 14th) unattached singles go out to drown their lonely sorrows in bowls of jajangmyun (Korean-Chinese Noodles). 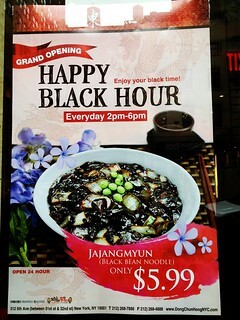 I guess the proprietors of Dong Chung Hong figure if there's a Black Day, then there can be a Black Hour. I doubt they can imagine it might sound like the title of a radio show hosted by Stokely Carmichael. Interestingly enough Black Day is a response to 'White Day,' (March 14th) which in Korea is the day when men are expected to give gifts of chocolate etc to their significant others. This is as opposed to Valentines Day when traditionally only women give to men.